The African cryptid known as the Ennedi Tiger is native to Chad, which lies below the Sahara desert. This cryptid is a cave-dwelling feline that lives in the mountains of Africa. It is much larger than a lion at up to twelve feet, and it is red or brown with white stripes. The Ennedi Tiger also lacks a tail. The one main feature of this cryptid, however, is its huge fangs. 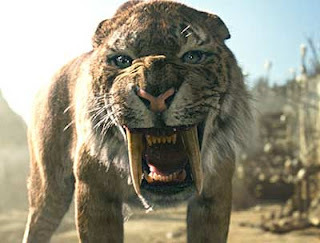 This obviously links the animal to the prehistoric Saber-Toothed Tiger, and indeed this supposedly-extinct beast is the main candidate for the true identity of this cryptid. Interestingly, another species of Ennedi Tiger is also occasionally reported, though this one is very different. It dwells in water, and has a reddish coat with white stripes, much like the other species. It also posesses long fangs, but this variety has a long tail as opposed to its tailless mountain-dwelling brother. This species is also compared to the Saber-Toothed Tiger, but also to a walrus. Still, the tiger explanation is more likely, as no other walrus relative lives in Africa. BeastPedia is a registry of cryptids, mythological beasts, creatures from folklore, and other animals that may or may not exist. Begun while I was a freshman in high school, it's currently being revised and updated for the first time in half a decade. As time goes by, I'll post more and more information, and make this blog an even better resource. © BeastPedia 2008-2014. All rights reserved.